On this page are a few drawings from many thousands found in my sketchbooks. I do most of my drawing in spiral-bound sketchbooks using pencils, pens, pastels, watercolor, coffee, tea and cheap facial makeup, or just about anything within reach that will make a mark. The drawings usually start with a very vague idea, or better yet, no idea at all until the first few marks are made. Sometimes they exist simply from attempting to work through an unclear idea, or while clarifying an idea that has yet to be fully worked out. Most of my sculpture comes from these drawings. The drawings are crude, but they give me enough information to develop the idea or at least advance towards a final answer. At times I use the drawings as "working drawings", and start the sculpture using the basic drawing and continue to make more drawings as the sculpture progresses. Other drawings are inspired by literature -- whatever I'm reading at the time. Some drawings are sparked by found scraps of paper, fragments of others notes, or discarded drawings from unknown sources. When I feel stuck, I draw as a form of introspection or self exploration, or just venting a frustration. 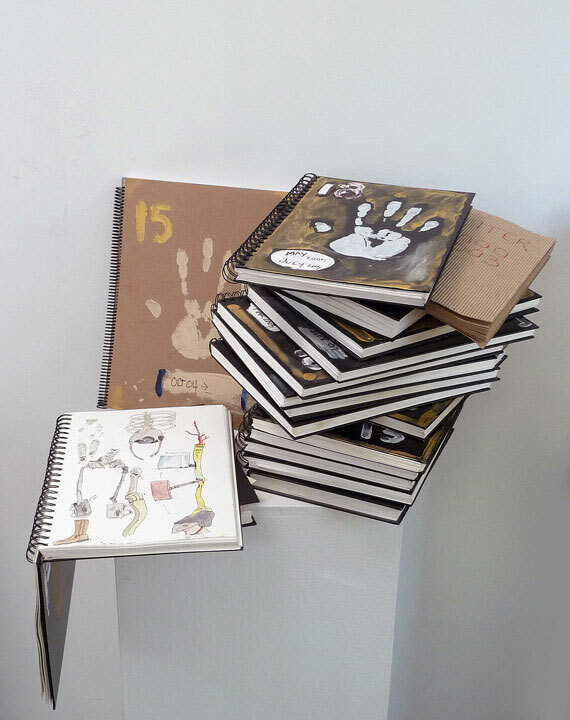 Artist note: My desire would be to have my sketchbooks professionally archived and cataloged.